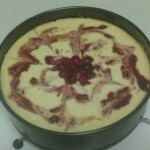 A creamy velvety cheesecake topped with ruby red cranberry sauce. A festive holiday treat perfect for the Thanksgiving or Christmas dessert table. For the crust,iIn a food processor add the almonds and process few minutes until ground. Add the butter, ¼ cup LC-Natural Sweet White, egg and salt and pulse few times until it forms a ball. Take the dough out and gently press it on the bottom and about 1 inch on the sides of a greased 8 inch springform pan. Turn the oven on and place a shallow dish with about 1½ inch water in it on the bottom rack. Wait until the oven temperature reaches 350F. For the filling: in a large mixing bowl add the cream cheese and ⅔ cup LC-Natural Sweet White, and mix until combined. Add the heavy creamy, eggs and the egg white and stir until creamy. Pour into the chilled crust. Bake without taking the water dish out of the oven for about 55 minutes or until the edges slightly become golden and the middle is just slightly wiggly. Turn off the oven, crack the door just a little bit and leave the cheesecake to slowly cool for the next two hours without taking it out of the oven. 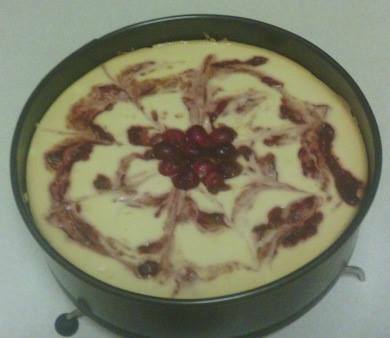 When the two hours are over, run a butter knife between the cheesecake and the sides of the pan for easy release. While the cheesecake is cooling down you can make the cranberry sauce. In a small saucepan add the cranberries, ¼ cup LC-Natural Sweet White and orange juice and cook, over low heat for few minutes until the cranberries have popped and they become mushy. Remove from the heat and cool slightly before spreading it on top of the cheesecake. Remove the cheesecake from the pan and enjoy!